I do not consider myself a picky eater. Sure, I don’t care for bananas, raisins remind me of bugs, and balsamic vinegar turns my tummy, but it’s not like I’d refuse to eat any of those things were someone to offer me one of them or use them [sparingly] in a dish. (Unless it was some sort of balsamic-raisin-banana hybrid, in which case I’d politely refuse and vomit quietly in a corner.) And, truthfully, I used to be much pickier – I didn’t like squash or sweet potatoes or pasta as a kid. Pasta! Oy. I’ve since discovered the joys of squash and sweet potatoes and pasta. In fact, these days, I’m quite adventurous in the food realm – I’ll try anything! I credit much of my foodventurism to becoming vegan – as an omnivore, I never went out of my way to try new foods, but now every trip to the grocery store is a chance to buy a new type of bean or experiment with an unfamiliar grain. In the past, you probably could not have paid me to purchase a product called “seitan tidbits” from the Asian section of the grocery store, nor could you have convinced me that fish-scented noodles made from tofu would be remotely palatable. But omnivore-Kelly is a girl of the past, and vegan-Kelly relishes the chance to try such a delightfully-named product as “seitan tidbits”. So… have y’all ever tried shirataki noodles? I’d heard rumors that fresh out of the package they smell like fish, and THEY TOTALLY DO. It’s weird and a little off-putting, but after taking a nice bath in some cold water, the odor of the sea dissipates (thank heavens). Apparently they’re a dieter’s best friend because they are quite low in calories and carbs, but I just wanted to try them because they’re so weird! You buy them in a squishy package from the refrigerated section of the grocery store, and they’re swimming around in fish-scented juice… mmm. 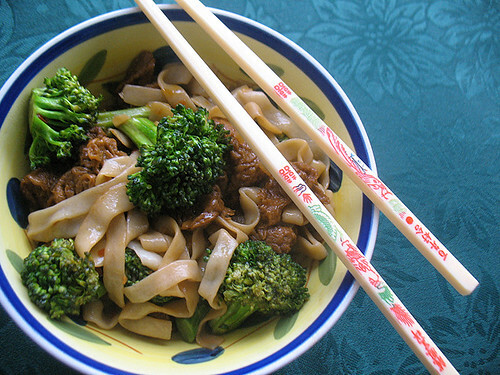 As you can see from that photo right up thurrr, I added my noodles to a broccoli-laden stir fry. Said stir fry also featured the aforementioned seitan tidbits, and let me tell you, this was one bizarre-o stir fry. The noodles were a little chewy, but they tasted just fine. The seitan tidbits, however, were just… weird. I ate one and thought, “Oh, these are okay!” but after chomping a few more, I changed my tune slightly. They were very, very squishy, and they kind of oozed some sort of liquid-y, oily substance. I didn’t even check their nutritional stats when purchasing them, but because they’re packed in oil, they’re disgustingly fat-laden, to the point where I felt a little sickish after dinner. Bleh. Have you ever tried either of these two items? What did you think about them? I’ve used Shirataki noodles with mixed results. Sometimes I love them but sometimes I don’t. I think it is a texture thing with me. I bought all sorts of seitan type products at my local asian market last week and am excited/nervous to try them. I did try a gluten loaf which was pretty good. It was just like seitan but more spongy, it sopped up the sauce really well! I’ve never encountered seitan packed in oil, so I can’t comment on that from personal experience. I make seitan at home and it’s really good. Sometimes we purchase it but it’s always packed in broth. I’m glad veganstockphoto.com has started. I hope the bloggers with good cameras join! I know the issue with bloggers’ photos is that they may not be high resolution enough to look good in print; but there are some great photographers in the vegan blogging world! I’ve seen the seitan bits, but I always passed on them because of the oil. I’m with Andrea: homemade seitan is where it’s at. What can I say? I love the shirataki noodles! I use them in soups, chow meins, and in place of potatoes or rice in certain dishes. My girl loves them with peanut sauce or a homemade noodle sauce I always keep in on hand: anything to keep her from asking for the MSG-and-HFCS-in-a-bottle stuff (I won’t name brands, but you know what I mean!). I think the trick to eradicating the “aroma” is to rinse well, before and after cooking. But, if you don’t like the texture, I don’t have any advice to offer! Take care and have a wonderful day!! Hope your surgery tomorrow goes well, and thanks so much for participating in the bake sale! The surgery went well!! :) Thanks so much to you too!